reside in Qatar for trade and to protect their lives and property. should hereafter desire them. I also undertake to protect them when established. myself or my subjects against others. and affixed our seal to this original document and four copies thereof. Dated 6th Moharram, 1335, corresponding to the 3rd November, 1916. Viceroy and Governor-General of India. at Delhi on the 23rd day of March A.D. one thousand nine hundred and eighteen. 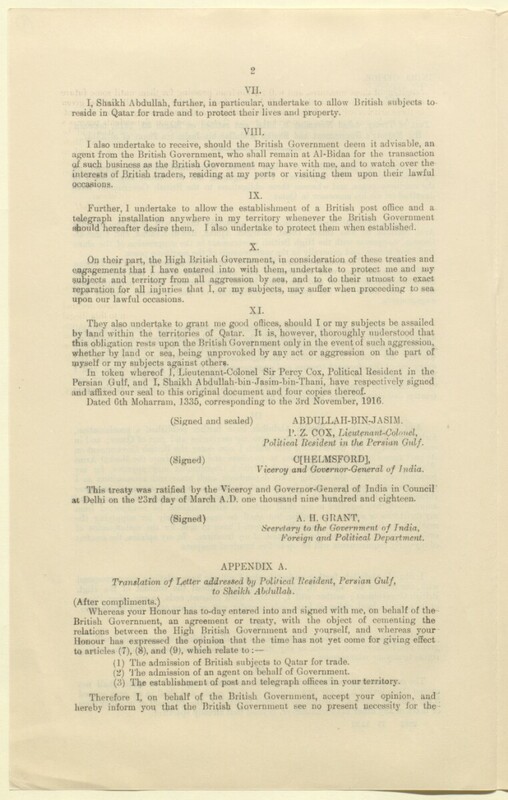 (1) The admission of British subjects to Qatar for trade. (^) 'J'he admission of an agent on behalf of Government. (3) The establishment of post and telegraph offices in your territory.